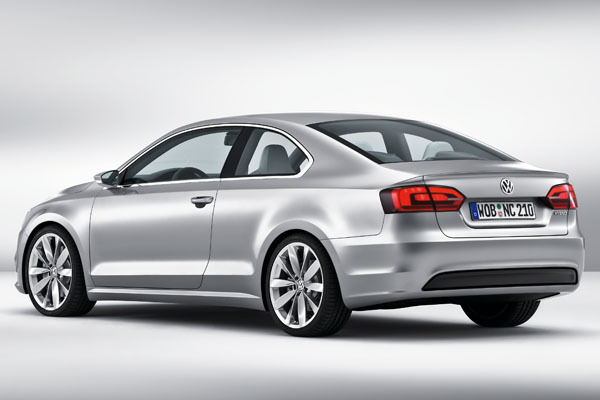 Yes, we know PoloDriver.com is primarily about the Volkswagen Polo, but today’s new model announcement from Audi was just too mad to pass up. Besides, the A1 is closely related to the Polo. So there. What exactly has Audi unveiled? 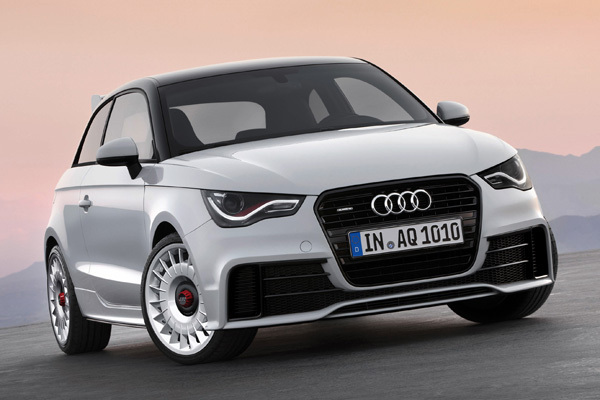 A 252bhp A1, called the quattro, with the engine from the larger S3, a four-wheel drive chassis, and looks inspired by the A1 Clubsport quattro concept, unveiled in May. Limited to only 333 units, there are doubts as to whether the car will be built with right-hand drive and therefore come to the UK – haggle your Audi retailer if you’d like it to be a rare sight on our green and pleasant lanes. And yes, we would. Performance of the A1 quattro looks to be explosive. The 0-62mph dash takes 5.7 seconds, and the car romps on to a top speed of 152mph. Maximum torque of 258lb ft is available between 2500-4500rpm, while all 252 horses are unleashed at 6000rpm. Standard transmission will be a six-speed manual gearbox mated to Audi’s famed ‘quattro’ four-wheel drive, specially engineered for the PQ25 Volkswagen Group small car platform. Exclusive ‘Glacier White’ turbine design 8.0 J x 18-inch cast alloy wheels with 225/35 series tyres transfer the power to the road, while black brake calipers grip 312mm diameter discs. Outrageous looks match the outrageous power. The A1 quattro is only available in Glacier White Metallic with a glass black roof, rear hatch panel, rear spoiler, and front grille frame. Two 100mm chromed exhausts poke out from the restyled gloss black diffuser, while strong red accents in the front and rear lights add further menace. The interior features heavily-bolstered sports seats with black ‘Silk Nappa’ leather with contrasting red stitching, brushed stainless steel pedals, a flat-bottomed multifunction steering wheel and individual numbered plaque. Arriving in the second half of 2012, the A1 quattro must have instantly become one of the most-anticpated cars of next year. No prices have yet been released by Audi, but it won’t come cheap. But, now we know that the technology is available, four-wheel drive Polo R anyone? The full Audi UK press release follows. Renault is king of stuffing large engines aft of the front seats into its small hatchbacks, but few people realise that Volkswagen has done it, too. 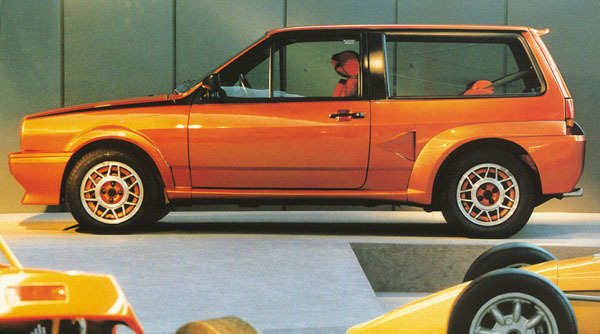 Showing its wild side, VW unveiled the rear-engined Polo Sprint at a company press conference in 1983. The idea was a simple one: to make a small and light, high-performance vehicle built using production components. A one-off prototype for evaluating handling data and aiding Volkswagen’s computer modelling, the Polo Sprint was rear-wheel drive, and powered by a 1.9-litre, flat-four engine from the Caravelle. Starting life as a 90bhp Caravelle Carat unit, a supercharger (which went to become the G40 blower), fuel injection and an intercooler boosted engine output to 155bhp, more than enough to give the Sprint a sometimes lively rear end. In a story detailing Volkswagen’s plans for the Eos and other convertible models, UK auto title Car today reports that an open-air Polo is ‘still-tentative’ and could be ‘built by Karmann, starting in 2012.’ In a fresh flurry of reports, the buyout of Karmann’s facilities by VW could signal the revival of a convertible Polo. 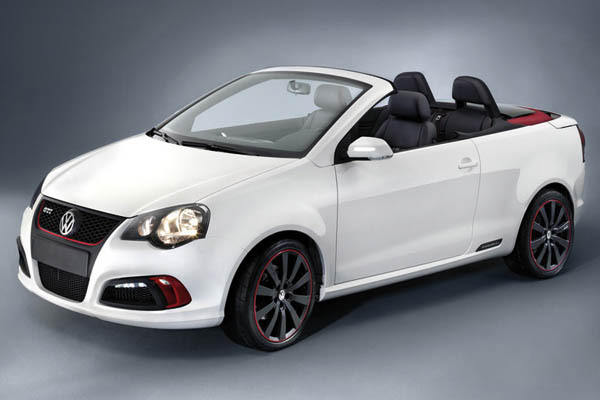 Of course, we’ve been here before, with the Polo Cabrio Concept of 2007 seen here. Actually built by Karmann as a one-off, the two-door, GTI-powered ‘study’, the Polo CC featured a soft top which included a glass sliding roof, an illuminated headliner using four small electroluminescent panels, foldable rear seats and a wide-opening boot. Could the proper open-air Polo idea be about to return? Does VW’s New Compact Coupé hint at the forthcoming Polo saloon? Volkswagen is having a busy time of it at the moment. 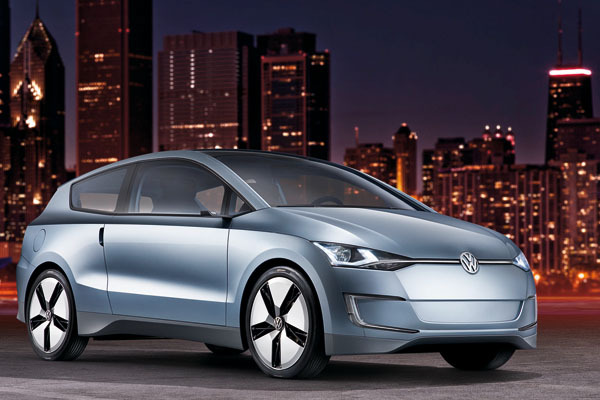 The company pulled the covers off the Indian version of the new Polo last week at the Auto Expo in New Delhi, and yesterday unveiled the New Compact Coupé (NCC) concept car at the 2010 North American International Auto Show in Detroit. Two debuts at two motor shows in two regions of the world a week apart is no mean feat. Premiering both the upcoming Jetta (or ‘Mid-Size Sedan’ being developed especially for the US market) and a hybrid powertrain, the NCC is powered by a 148bhp 1.4-litre TSI engine coupled with a 25bhp electric motor using lithium-ion batteries. The German automotive giant states that 48mpg is achievable, along with 98g/km of CO2, a top speed of 141mph and 0-62mph in 8.1 seconds! Of more interest to us, though, is the styling. There’s no denying the NCC is a handsome piece of kit, but take a second look at the frontal aspect. There’s more than a hint of Polo to the forward-facing styling elements of the NCC and although the looks will no doubt be referred to as VW’s ‘new corporate face’ (which is partly true), there’s definitely more Polo-inspired DNA in there than either Golf or Scirocco. A new notchback version of the fifth-generation Polo has been widely reported as on its way, but the question that begs to be asked is, does the NCC at least give a subtle hint to how the still-to-be-unveiled saloon will look? We know the smaller car will be a traditional four-door and not the more rakish two-door of this concept, and that the NCC is slated to be positioned between the Scirocco and Passat CC (Golf Coupé then) if it ever makes it to market. But, if the new Polo saloon looks this good, it should banish the memories of the awkward Series 3 notchback of 1996 forever. With 2009’s Up! Lite concept (above) unwrapped at the Los Angeles Motor Show pointing the way for possible future Polo styling references, Volkswagen seems to be pushing its new-found small car styling confidence and visuals onto many new and forthcoming models. Exciting times. 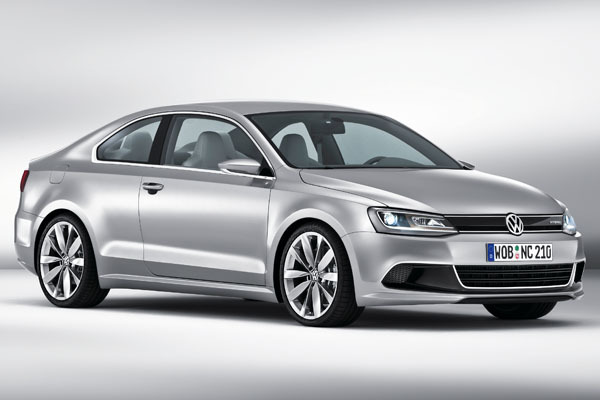 What do you think of the NCC: does it premier the likely new look of the Polo saloon, and, if so, would you buy one? Join the discussion and leave a comment below.